Sing Us The Song Of Your People! This entry was posted in Diversity is Our Strength Establishment Media Fail on September 19, 2017 by pf3805. It takes an increasingly strong stomach to follow current affairs any more, such is hypocrisy displayed by the people best positioned to influence them (Paul Ryan and his ‘Not who we are’ and ‘America is an idea!’ hectoring being a perfect example). 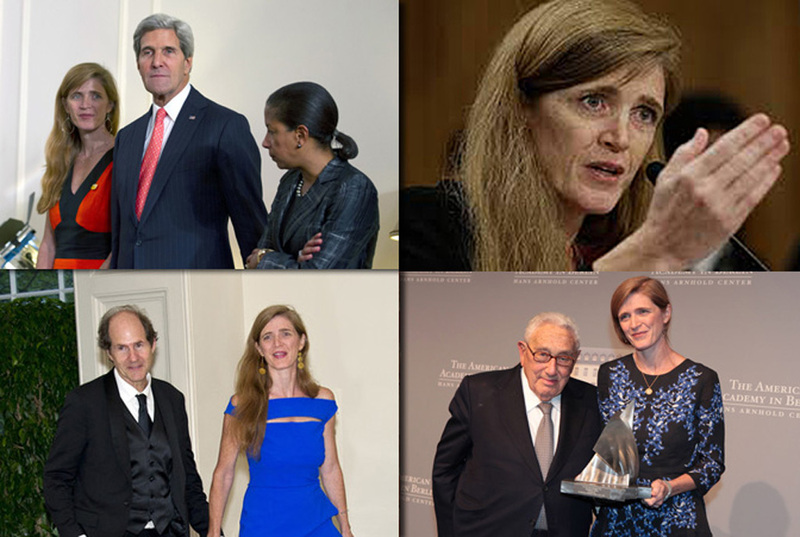 Clockwise from top left:Samantha Power with John Kerry and Susan Rice, Power gesticulating with manly hands, Power with fellow warmonger Henry Kissinger, Power with husband Cass Sunstein. If a strong stomach is needed to follow current affairs, an over-active bile duct is a definite advantage in participation; as the clips from Paul Ryan demonstrate, gall and effrontery are the dominant – and at times sole – attributes needed to sing from the establishment hymnal. 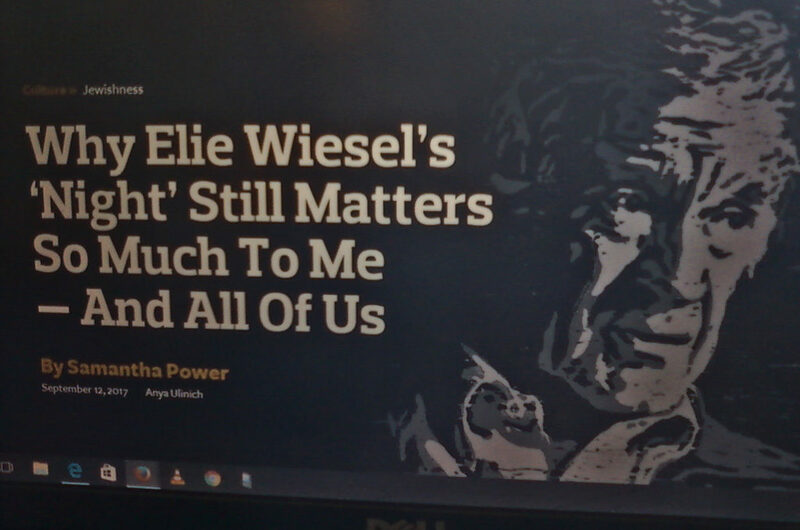 Recent days have provided a sterling example of this in the form of Samantha Power, former Obama Administration National Security Council and United Nations alum and erstwhile anti-genocide crusader, penning a forward to the latest edition of Elie Weisel’s social justice classic, Night. Because appropriating the memory of a genuine Holocaust survivor is perfectly acceptable when attempting to deflect from your own role in throwing an entire region into mass murdering chaos (Not to mention it’s another clipping to add to the bio). Injustice was still rampant. Genocide denial against the Armenians, the horrors of his lifetime — Pol Pot, Bosnia, Rwanda, Darfur, Syria in his later years. He lived to see more and more people bear witness to unspeakable atrocities, but he also saw that indifference remained too widespread. Amid all the pain and disappointment of Elie’s remarkable life, how is it that the darkness did not envelop him, or shield him from the sun? As our nation goes through difficult days, “Night” is a book that is firmly ingrained in that small canon of literature that kids and young adults read when they are growing up in America. Alongside Atticus Finch and Scout, one of the narrators that will have an early shot at shaping our children’s moral universe is 16-year-old Elie. So, while the void is enormous — above all, for Marion, Elisha, and the rest of the family — and the void is enormous for our world, I too am filled with profound joy knowing that my 7-year-old boy and my 4-year-old girl — like Elie’s grandkids, and their children after them — will wade into big questions for the first time with Elie Wiesel as their guide. Seek out a position of influence and authority less because you want to serve and have demonstrated expertise (read: real world expertise, and not simply convincing some crony to publish one of your manuscripts) and more because you covet the status and power that accompany the position. Once ensconced, neglect the actual duties of the position (i.e. Power’s nominal duty to advance the cause of world peace and the national national security of the US in her time at the NSC or UN) and instead use it purely for advantage-seeking reasons: ingratiating yourself to superiors, rewarding cronies, maneuvering against rivals (See: Power’s role in spying on the Trump campaign and transition team in 2016). After the results of your neglect have become apparent (i.e. Power’s role in agitating for intervention in Libya with its resulting spread of Salafist terrorism across North Africa and the flooding of Southern Europe with MENA migrants), use whatever fruits you’ve cultivated from your self-serving networking to obfuscate, spin and blame-monger (in the lingo of our modern technocrats ‘set the narrative’). Left: The Three Horsewomen of the Arab Spring Apocalypse, Susan Rice, Samantha Power and Hillary Clinton. Right: Power confers with her husband’s law school buddy and boss, Barack Hussein Obama. And like most of these people – ahem, Susan Rice – Power has enhanced her status through marriage, in her case to Cass Sunstein, a media darling ‘legal scholar’ and longtime Obama crony. It’s some sign of how decadent our establishment has become that legal positivism can be the basis for any form of celebrity but, lest anyone feel too envious towards Cass, let us point out that a man would have to try very, very hard to find an Irish woman as mannish and ugly as Samantha Power. Irish Women 101: You go for the one on the left, not the right. As the convoy barreled through a village in northern Cameroon on Monday, a 7-year-old boy darted to the road, excited to see the chain of white S.U.V.s carrying Samantha Power, the first cabinet-level American official to visit the country since 1991. Distracted by a thundering noise, the boy glanced up at the helicopter providing security from above. Suddenly, he was struck dead — killed by the same convoy that had brought officials to showcase American efforts to help protect West Africa’s women and children. Left: Power exiting kid-crushing motorcade, Center: Power taking photo op with uncrushed Cameroonian kid, Right: Power greeting line of kids, apparently happy to be left uncrushed. All other things being equal, Samantha Power is living the Social Justice Warrior dream: parlaying her political ruminations into a paid writing gig, hitching her star to a powerful crony network, marrying into a high status couple, touring the world and being seen among suitably diverse demographic groups while availing oneself of the sorts of photo ops that look so good on a book jacket or in a Vanity Fair article or in an author’s bio. And if the stairway to heaven is paved with the occasional crushed kid or gassed village, keep your head held high – after all, you meant well!